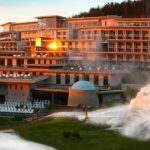 Filled with thermal waters at various temperatures and being open all over the year, the pools, alternative baths and steam chambers of the thermal baths are especially popular among guests. There is direct access in between the Thermal Baths and the Pleasure Baths. The indoor and outdoor pools equipped with water massage jets and mushroom showers can complement the medical treatments with medical water massages. Under the shade of the trees of the Great Forrest, the bathing guests of the summer season can find pools with medicinal waters, a 50 m swimming pool, as well as wave and children pools. 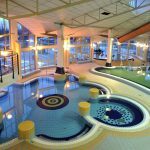 The medicinal baths of Debrecen are rich in valuable organic and inorganic materials, and especially suitable for the treatment of locomotor diseases. Our therapeutic division provides nearly 40 different types of treatments based on the benefits of medicinal waters, as administered in co-operation with specialist doctors. Our specialists make up personal curative programs based on the results of medical examinations. In the therapeutic centre, beside traditional spa water therapies, physiotherapy, movement therapy and a wide range of psychological treatments are offered. Aquaticum Mediterranean Pleasure Baths can be accessed directly from our hotel via a glass-walled corridor. The abundant tropical flora and adventure elements of the special water centre conjure summer out of every single day of the year. 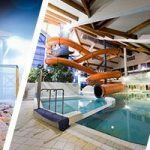 In the Baths, a wave pool, a children and baby pool, 12 slides, a climbing wall, slow-river corridors, water massage jets , mushroom and neck showers, cave pools, pleasure paths and water choppers offer great entertainment. In the Mediterranean Pleasure Baths, a Mediterranean Restaurant, Thai Massage Centre, as well as a Sauna Centre equipped with a Finnish sauna and steam chambers serve the recreation of our guests.